On the 23rd June 2018, Horizons will be participating in the Eddystone Charity Pursuit. 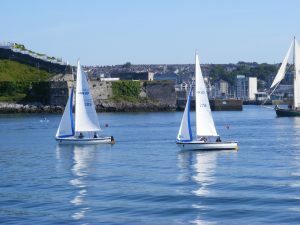 This is a 26 mile sail to the Eddystone Lighthouse and back. This year we are entering 9 boats, split into three teams, and they are all helping to raise money for Horizons by collecting sponsorship. If anyone would like to help us to raise some sponsorship you can donate direct to us at a club session or you can download a Eddystone Sponsorship Form 2018 and collect from friends and family that way. We really appreciate all your support!